Hipster News Flash....Venus: the HOTTEST lounge in the world! As a zealous yet particular maven for the ultimate cocktail lounge experience, please allow me to introduce Club Venus, arguably the number one greatest nightclub in the world. It is, without exception, the coolest nightclub I have ever been to in my life. Great drinks, great decor, great ambience, great entertainment, great location, great looking customers, bartenders, and cocktailers. That's all I can ask for, and Venus has it in abundance. "Venus is a jetsetter's dream. Fabulous 50's/60's style furniture and lamps; wall murals of the olden days of the Vegas strip; fabulous wall-hangings on other walls; and a stage with gold lame' curtains and a leopard-print floor...VERY cool. I was in awe...."
COOLEST bar set up I have ever seen." "Both sections of the club are amazing, I couldn't pick a favorite if I tried. The Tiki Cove was designed by Bosko ... it's out of control. If you are into tiki you MUST SEE THIS PLACE, you will flip out. The lounge section is PLUSH!! If you are into lounge, you MUST SEE THIS PLACE!! They are both really amazing..."
level breezeway" overlooking the famed Las Vegas Strip. This very stylish retro bar features top-notch entertainment nightly, with two great rooms, and two great stages. 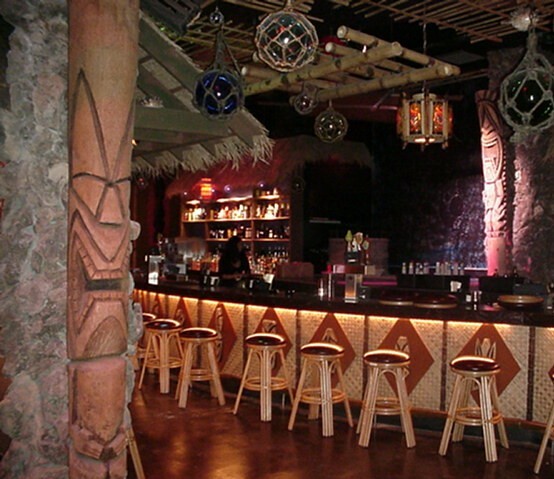 The Tiki Bar, "Hidden Cove" was created singlehandedly by the world's leading tiki master, the nenowned Bosko. A lagoon's worth of bamboo, lava rock, palm and redwood has been hand carved by Bosko himself, to create "Taboo Cove," the ultimate south-seas getaway, where blue caraco flows like polynesian waters. Every detail was created by Bosko, even the exotic mugs and lavish bar menu. (No swizzle-stick collection can ever be complete again without a liqour-soaked Venus twizzler.) There is a stage behind and above the bar, lined, perhaps not surprisingly, with bamboo. There is talk of moving a Hammond B3 into the room, where I might play organ with Doug Denada on bongos. Yes, Russel - Organ & Bongos - live on the strip!!!! 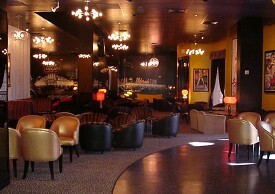 The Vegas Lounge and Showroom is the reveler's homage to Old Vegas as "The Entertainment Capital of the World." Vintage photos and and murals celebrate the glamour and excitement that put Vegas on the map. The vintage furniture is elegent, comfortable, unique, and fascinating. You know, I just love playing in front of that gold lame' curtain, on leapord carpet! The entertainment calandar is excellent, a mix of national and local bands and burlesque artists. The club opened with The Royal Crown Review, followed by rockabilly great Deke Dickerson, with many national acts to follow. Next Ingrid Lucia of the Flying Neutrinos will play Venus, with Monty Banks and the High Rollers as her "backup band." Top Las Vegas swing/lounge acts have played Venus: The Las Vegas Nines; Jump, Jive, and Wail; Vargas; and Monty Banks and the High Rollers. The High Rollers have played Venus more often than any band so far, with four performances in the last week, and more to come this week. Burlesque royalty The Fabulous Pontani Sisters opened the club, and have continued on their national tour. The Shim Shamettes will come up from New Orleans in the next couple weeks. 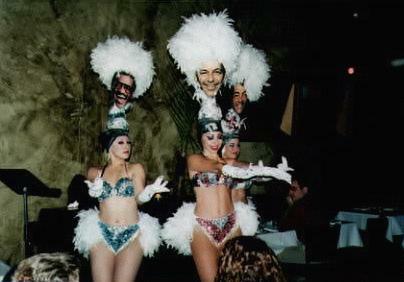 Doug Denada and I are working tirelessly to help create a Las Vegas based company of burlesque performers. I encourage you to visit Las Vegas immediately, to check out Club Venus for yourself!